Vlad Holiday of Born Cages on "Don't Look Back." It’s 12 am on a stormy Wednesday and the members of Born Cages are homeless for the night. After a half hour of continuous searching, lead singer and guitarist Vlad Holiday finally finds a hotel with open rooms just as his phone emits one last flash of light and dies. 7 hours earlier, Born Cages, Dreamers, and The Kickback arrived at The Canal Club in Richmond for the first night of their 20 date tour. After they had navigated I95 in the rain to reach Richmond from their Brooklyn home, I met up with Vlad Holiday (lead vocals and guitar), Matt Maroulakos (bass and keys), and Dave Tantao (drums) of Born Cages just as the skies began to clear. Their faces were marked with bags under their eyes from the long drive but their mouths quickly broke into friendly, excited smiles. The members of Born Cages have every reason to be exited. 2015 is shaping up to be a big year for the trio. 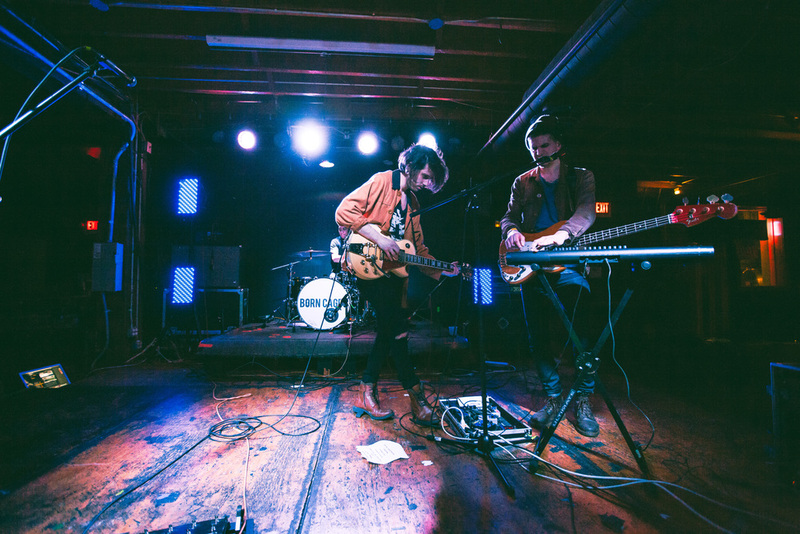 Their debut album, I’m Glad I’m Not Me comes out on June 2 via Washington Square (pre-order here) and they’re currently making their way down to SXSW with Dreamers and The Kickback before headed out on The Warped Tour this summer. When I arrived at The Canal Club, I was surprised to see a fourth merch table surrounded by a small crowd. A variety of items bearing the words “Port Harbour” lay neatly next to each other. The “small crowd” turned out to be the six members of Harrisonburg based Port Harbour along with some dedicated members of their fan base. When the six piece band launched into their first song, I immediately understood why their fans made the drive to Richmond. Port Harbour brilliantly combines the talents of its members to create a wonderfully full sound with rich harmonies balanced by dynamic song composition and a variety of instrumentation ranging from trumpet to accordion. In the darkness of The Canal Club, they played a collection of songs from Wake, their debut 11 track album. By the end of their set, they had gained several new fans, including myself and the members of the other bands. The Kickback followed up with their blues influenced, Twin Peaks inspired take on indie rock. Their blend of easy to sing-a-long to choruses with catchy, but driving, guitar riffs interspersed by charmingly self-deprecating banter made for a highly enjoyable set. The Kickback ended with a half spoken, half sung song called “Rob Our House.” The track humorously relays the story of how the house Yost was sharing with his brother was robbed within the first week they moved to Chicago. The song progressively built in intensity and volume, culminating in Yost dropping his guitar onto the stage and allowing the feedback to slowly overtake the rest of the band like a wave of wailing police sirens responding to a robbery in progress. The Kickback, moments before Yost let go of his guitar and let it fall to the floor. After Yost retrieved his guitar, the three members of Dreamers walked onto stage with all the confidence of a band that is going on tour with Stone Temple Pilots; which makes sense considering they are joining STP on the road this April. Despite being the first trio of the night, Dreamers delivered a sound just as robust as any 7 piece band. Their punk rock infused riffs and well written vocal hooks carried kept the energy levels high during their set as they played through their self-titled EP. On “No Love,” the trio smoothly transitioned between powerful verses and a harmony heavy chorus that would leave McCartney and Lennon feeling right at home. The track concluded with a passionate solo from front man Nick Wold, in which he finished off the last notes with his teeth. Dreamers’ also played several tracks from their debut album, This Album Does Not Exist, which is due in September this year. Nick Wold finishes a solo with his teeth. Following Dreamers’ performance, Holiday, Maroulakos, and Tantao quickly unpacked keyboards and guitars from a multitude of cases with “Born Cages” stamped on the side. Like the three opening acts, Born Cages provide a refreshingly unique take on indie rock. They kicked off their set with “Don’t Look Back,” a song that invokes the feeling of being at a secret roof top performance in the summer with the New York City skyline competing against the setting sun as a backdrop and features a blistering guitar solo that balance melody with speed like a Brian May, Van Halen hybrid. “Don’t Look Back” was followed up with “Caiti”, a song that encapsulates the frantic, anything can happen feeling of a wild night out with your best friends, tied together by Holiday’s vocal top lines. Other tracks, like “Rolling Down The Hill” and “Metaphor” provided rich, anthemic choruses, well suited for the giant festival stages of The Warped Tour. All together, Born Cages hour long performance struck an ideal balance between upbeat song writing and energetic rhythms that held the audience captive until the last note was played. Dave Tantao lifts his sticks in the air as Born Cages finish their set. After the show, Holiday, Maroulakos and Tantao loaded gear into their van as freight trains rumbled by on the trestles adjacent to the parking lot. The hotel reservation had gone through just before Holiday’s phone died and everyone looked relived by the thought of a good night’s rest before continuing the tour the next day in Charlotte, North Carolina. Born Cages will return to Virginia on July 8 at Farm Bureau Live with the Vans Warped Tour. Tickets are available here.